Want to Create Your Own Planner? 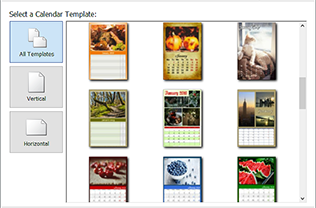 Make various planners with Photo Calendar Creator! The life of modern people is getting faster, more intensive and full of activities. How to catch up with it and stay on the top of the wave? The solution is as simple as an apple pie - create your own planner and schedule your life. It is absolutely impossible to keep all those assignments, meetings, birthdays, phone calls and workout timetables in mind. A good planner will help you make your work more efficient, your sport achievements more significant, and your social life more eventful. You may want to customize the size, dates, etc. – in a word, you want a personalized photo planner that’s hard to find in stores. Need some ideas to get inspired? Take a look at the examples below! 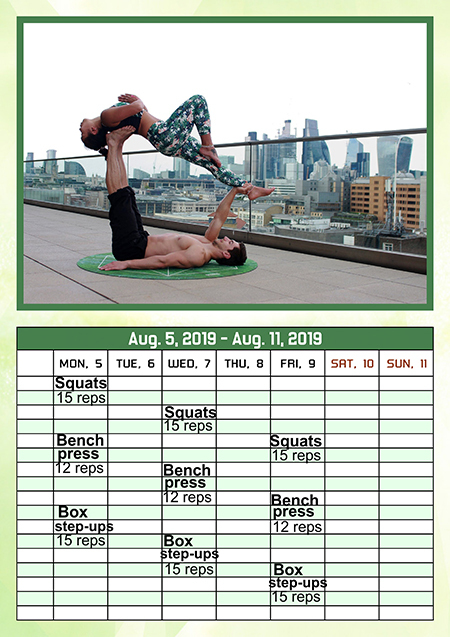 They were made in Photo Calendar Creator. It’s an easy calendar app with hundreds of editable templates for you to get started. Like the designs? Then it’s time to see how Photo Calendar Creator works. To begin with, click the link below, download the free version of the program and install it on your computer. 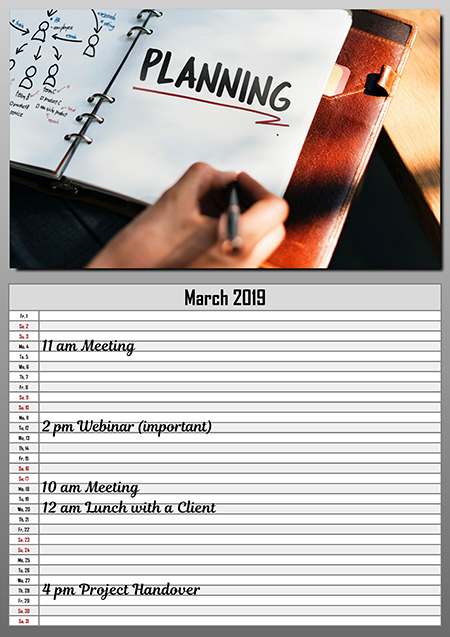 Now, let’s follow 5 easy steps and learn how to make your own monthly planner. Run the software and click on New Project. Next, you need to choose a suitable calendar type. 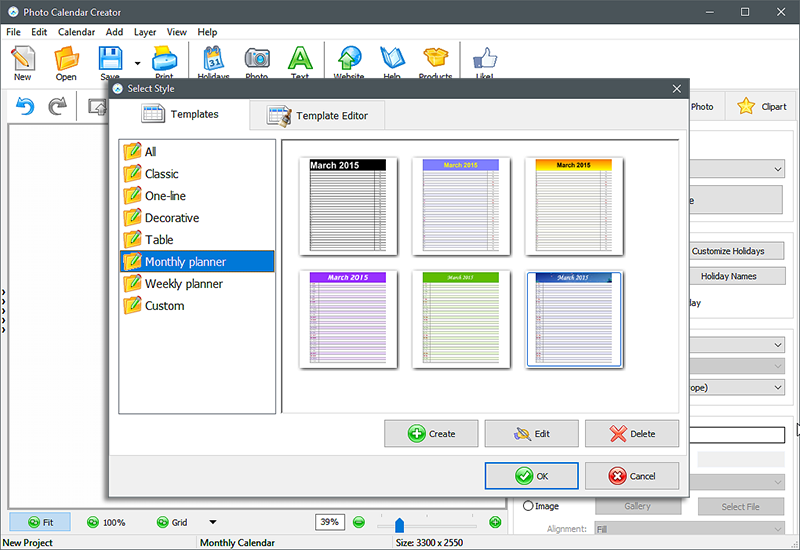 To make a planner, you can select Monthly calendar, or click Custom and pick the Planner calendar. Add your own images or a photo collage and set the starting year and month of your reminder. 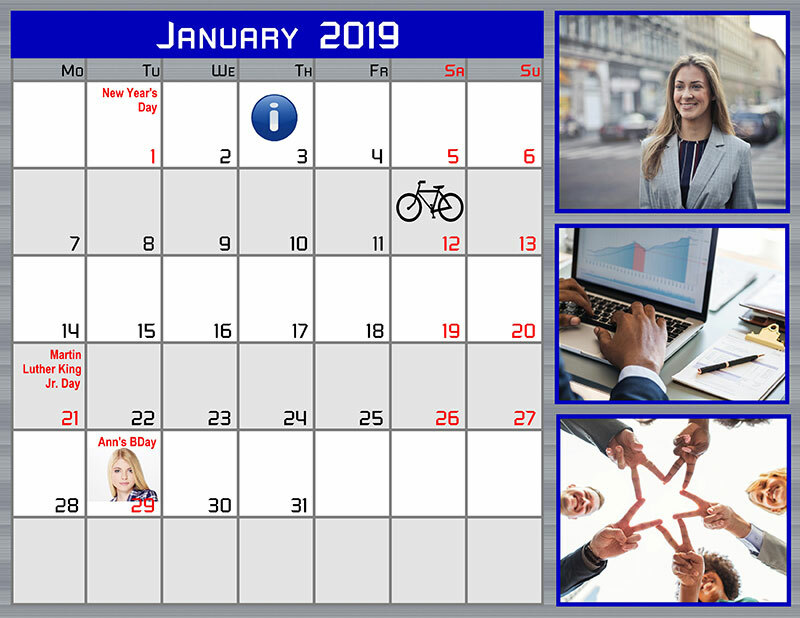 To make a calendar in 1 minute, pick one of ready-made month templates. If you want to create your own planner, edit the month style. 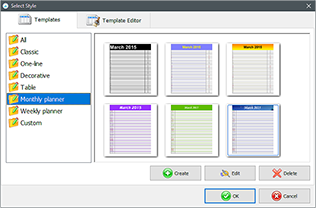 In Template Editor, change the font, alignment, and color of weekday names, weekends and holidays. Highlight even or odd rows, and pick a suitable background: a color, a gradient or an image. 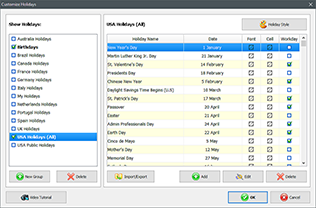 There’re public holidays of different countries in the program, but you can create groups of your own dates and celebrations, name them and tick a particular group to display in your planner. 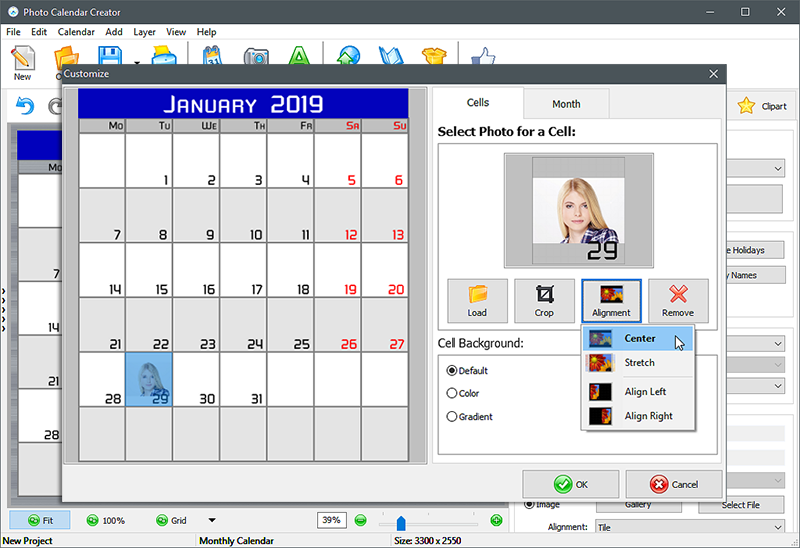 Also, you can insert photos of your family members, friends or colleagues in certain cells to mark their birthdays. To prettify your planner pages, use cliparts from the large built-in collection. Under the Clipart tab, you’ll find different categories of decorations: travel, romance, school, beauty and others. If you want to personalize your planner with meaningful wording, switch to the Text tab, add a new text caption, put it where you want and pick a font and color for it. 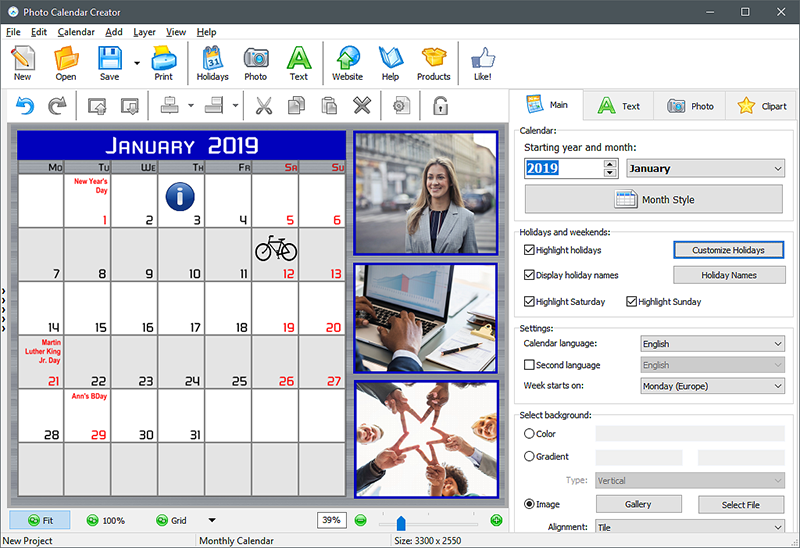 If you are totally happy with your personalized photo planner and want to use it in your future calendars, you can create your own planner template. To do that, click the Save as Template option under the Save button. Now, it’s high time to print your creation. Hit the Print button, adjust the printing settings and in less than 1 minute you’ll get your planner in your hands. Now that you’ve learnt to create your own planner, try making other calendar types. 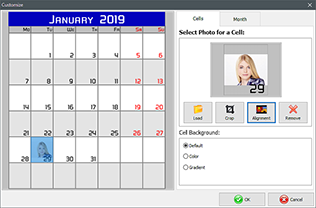 For example, make a desk calendar with your photos, a printable school calendar or a pocket photo calendar to carry it in your handbag. 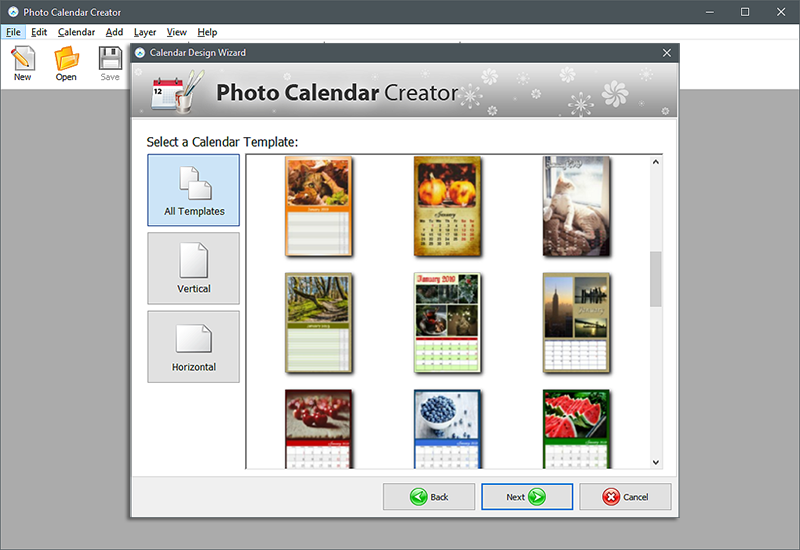 With Photo Calendar Creator, it’s easy and full of pleasure!